After many years with the group, Dr. Berhane Temelso is moving to College of Charleston to do research computing. Good luck, Berhane!! Dr. Tuguldur Togo Odbadrakh joins our group after finishing his PhD with Prof. Ken Jordan at University of Pittsburgh. Welcome, Dr. Togo!! Our paper on the complexity of (H2O)11 strucuture and potential energy surface is out in print at J. Chem. Theory and Comp..
Our paper on the effect of mixing ammonia and amines on sulfate aerosol formation is out in print at J. Phys. Chem. A.. It was selected as ACS Editors' Choice. Dr. Shields is one of three professors from across the nation to be named a 2018 Cottrell Scholar TREE Award recipient. We have an opening for a postdoc or research scientist position. Please apply here or send inquiries via email. Our group is excited to be spending a week visiting Dr. Brooks Pate's lab at University of Virginia. Our collaboration with Amanda L. Steber, Cristóbal Pérez, Anouk M. Rijs, Brooks H. Pate, Zbigniew Kisiel, and Melanie Schnell on acenaphthene's complexation with with water clusters is published at J. Phys. Chem. Lett..
Our group hosted the 16th MERCURY conference for computational chemistry. It featured six lectures by prominent keynote speakers, an undergraduate poster session and a lot more. Skylight is fully operational and open to all MERCURY consortium members. Please see the quickstart guide here. Skylight, our new MERCURY HPC cluster, arrived. You can see its specs here. It was purchased through an NSF-MRI grant and hosted at Clemson University's datacenter. The cluster is expected to go into full production in June 2017. Our collaboration with Cristobal Perez, Amanda L. Steber, Anouk M. Rijs, Juan Carlos Lopez, Zbigniew Kisiel and Melanie Schnell on corranulene and its complex with water is published here. Our paper outlining ArbAlign, a tool for aligning arbitrarily ordered molecules, is published here. Dr. Shields gave a talk to the University of Virginia Department of Chemistry at the invitation of Dr. Brooks H. Pate. MERCURY consortium was awarded an NSF-MRI grant to purchase a new computer cluster. The cluster is expected to go into full production by May, 2017. After six wonderful years at Bucknell, our group has moved to Furman University. We are grateful to Bucknell University, our chemistry department colleagues and our many great students for making the last six years enjoyable and productive. Please look for us if you are ever in the Greenville area! Our group hosted the 15th MERCURY conference for computational chemistry. It featured six lectures by prominent keynote speakers, an undergraduate poster session and a lot more. Our collaboration with Prof. Brooks H. Pate (Virginia), Prof. Zbigniew Kisiel(Polish Academy of Sciences), Jeremy O. Richardson(Cambridge/Durham), Adam A. Reid(Cambridge), David J. Wales (Cambridge), Stuart C. Althorpe(Cambridge) on quantum tunneling in water hexamers was published in Science. You can read the paper, and perspective piece and video describing its significance. "Running a productive lab where students are transformed and you actually publish"
"Optimal superposition of arbitrarily ordered molecules using the Kuhn-Munkres algorithm"
"Effect of single and multiple types of bases on aerosol formation rates"
Our group was awarded 350,000 SU (core-hours) worth of computer time on NSF's XSEDE facilites at the San Diego Supercomputing Center (SDSC-Comet) and Texas Advanced Computing Center (TACC-Stampede). Our group was awarded a three-year NSF-RUI grant to study the thermodynamics of secondary aerosol formation. You can find the summary here. Our group hosted the 14th MERCURY conference for computational chemistry. It featured six lectures by prominent keynote speakers, an undergraduate poster session and a lot more. Our four students (Bobby Cao, Nana Appiah-Padi, Fern Morrison and Grace Kim) concluded their busy summer by presenting their research findings at the Sigma Xi and MERCURY Poster Session held here at Bucknell University. Our collaboration with Dr. James Swan on the "Formation of deprotonated 2-imidazoline-4(5)-one product ions in the collision-induced dissociation of some serine-containing dipeptides" was published. You can find the article here. Our article on "The Importance and Reliability of Small Basis Set CCSD(T) Corrections to MP2 Binding and Relative Energies of Water Clusters" came out online. 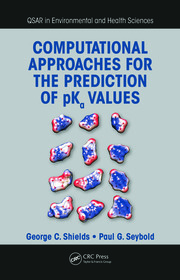 Dr. Shields's and Seybolds's review article on "Computational Estimation of pKa Values" got published. Dr. Shields was given the ACS Award for Research at an Undergraduate Institution on March 24th in Denver at an awards ceremony. You can see the collage below. This award is given by Research Corporation for Science Advancement to one chemistry faculty member every year "to recognize the importance of research with undergraduates. The award will honor a chemistry faculty member whose research in an undergraduate setting has achieved wide recognition and contributed significantly to chemistry and to the professional development of undergraduate students." You can read a Chemical and Engineering News article about it. Our group was awarded 500,000 SU (core-hours) worth of computer time on NSF's XSEDE facilites at Texas Advanced Computing Center (TACC-Stampede). Our collaboration with Prof. Brooks H. Pate at the University of Virginia and Prof. Zbigniew Kisiel at the Polish Academy of Sciences on the structure of water nonamers and decamers resulted in paper published in Angewandte Chemie. You can read the article here. Our article on the hydration of the sulfuric acid−Methylamine complex and implications for aerosol formation came out online. Dr. Shields won the " ACS Award for Research at an Undergraduate Institution " sponsored by Research Corporation for Science Advancement. The purpose of the award is "to recognize the importance of research with undergraduates. The award will honor a chemistry faculty member whose research in an undergraduate setting has achieved wide recognition and contributed significantly to chemistry and to the professional development of undergraduate students." "The award consists of $5,000 and a certificate. Up to $2,500 for travel expenses to the meeting at which the award will be presented will be reimbursed. Research Corp. will also provide a grant of $5,000 directly to the recipient's institution." Drs. Shields and Temelso attended the 248th ACS National Meeting in San Francisco, CA. Dr. Shields gave a talk on "Exploring the Rich Potential Energy Surface of the Water Undecamer". Our group hosted the 13th MERCURY conference for computational chemistry. It featured six lectures by prominent keynote speakers, an undergraduate poster session and a lot more. Our four students (Joel Mabey, Dechen Yangkyi, Bobby Cao and Nana Appiah-Padi) concluded their busy summer by presenting their research findings at the Sigma Xi and MERCURY Poster Session held here at Bucknell University. Our group's undergraduate research program gets underway with two Bucknell students (Joel Mabey and Dechen Yangkyi), and Lewisburg Area HS's Nana Appiah-Padi and an incoming BUcknell freshman, Bobby Cao as part of Bucknell's NSF-STEP program. Our paper entitled "Structural Analysis of Alpha-Fetoprotein (AFP)-like Peptides with Anti- Breast-Cancer Properties" got published. Our article on the structure and thermodynamics of H3O+(H2O)8 clusters came out online. Our group hosted the 12th MERCURY conference for computational chemistry. It featured six lectures by prominent keynote speakers, an undergraduate poster session and a lot more. Our three students concluded their busy summer by presenting their research findings at the Sigma Xi and MERCURY Poster Session held here at Bucknell University. Our benchmark data on water clusters got posted at The Benchmark Energy & Geometry Database (BEGDB). A cover article co-authored by Cristóbal Pérez, Simon Lobsiger, Nathan A. Seifert, Daniel P. Zaleski, and Brooks H. Pate at University of Virginia, Zbigniew Kisiel at the Polish Academy of Sciences and our group came out online. It is entitled "Broadband Fourier transform rotational spectroscopy for structure determination: The water heptamer"
Drs. Shields and Temelso attended the 245th ACS National Meeting and presented their research. Dr. Temelso talked about "Better Configurational Sampling Methods for Large Water Clusters" while Dr. Shields presented on "Accurate modeling of noncovalent clusters of atmospheric interest". Our group was awarded 500,000 SU (core-hours) worth of computer time on NSF's XSEDE facilites at the San Diego Supercomputing Center (SDSC-Trestles) and Texas Advanced Computing Center (TACC-Stampede). Dr. Shields attended the 53nd Sanibel Symposium in St. Simon's Island, GA.
Our group was awarded 200,000 SU (core-hours) worth of computer time at DOE's NERSC facilites. Drs. Shields and Temelso attended the 31st Annual AAAR (American Association for Aerosol Research) conference in Minneapolis, MN. Our group was awarded a three-year NSF-RUI grant to study the thermodynamics of secondary aerosol formation. The MERCURY consortium headed by Dr. Shields was awarded an NSF-MRI grant to purchase a computer cluster that will be used by twelve institutions that comprise the consortium. The cluster will be purchased this Fall and hosted at Bucknell. Drs. Shields and Temelso attended the 244th ACS National Meeting and presented their research. Dr. Temelso talked about "Quantum mechanical study of sulfuric acid hydration and its atmospheric implications" while Dr. Shields presented on "Benchmark structures and binding energies of small water clusters". Our group hosted the 11th MERCURY conference for computational chemistry. It featured six lectures by prominent keynote speakers, an undergraduate poster session and a lot more. Our five students concluded their busy summer by presenting their research findings at the Sigma Xi Poster Session held here at Bucknell University. We started a 10-week summer research session with five Bucknell students. Judy Phan, Kat Klein, Carla Renner and Danielle Bustos will study the thermodynamics of binary and ternary nucleation of sulfuric acid while Matt Szucs will perform a computational rationalization of collision induced fragmentation of some dipeptides. Our collaboration with Prof. Brooks H. Pate at the University of Virginia and Prof. Zbigniew Kisiel at the Polish Academy of Sciences resulted in a Science paper. You can read the article and a perspective piece describing its significance. A C&EN summary is available here. Devon Husar's paper entitled "Hydration of the Bisulfate Ion: Atmospheric Implications" came out in print. Our paper entitled "Quantum Mechanical Study of Sulfuric Acid Hydration: Atmospheric Implications" came out in print. Dr. Shields attended the 52nd Sanibel Symposium in St. Simon's Island, GA.
Our paper on "Benchmark Structures and Binding Energies of Small Water Clusters with Anharmonicity Corrections" came out in print. Berhane joined a Bucknell group for a working visit to IBM's Watson Research Center in Hawthorne, NY. Drs. Shields and Temelso attended the 242nd ACS National Meeting and presented their research. Dr. Shields talked about "first principles modeling of the formation of atmospheric hydrates" while Dr. Temelso presented on "correcting for vibrational anharmonicity in small water clusters". Devon Husar, Edgardo Parrilla and Judy Phan presented posters the 10th MERCURY conference for computational chemistry held here at Bucknell University. Our group hosted the 10th MERCURY conference for computational chemistry. It featured six lectures by prominent keynote speakers, an undergraduate poster session and a lot more. Devon Husar, Edgardo Parrilla and Judy Phan presented posters of their summer research at the Sigma Xi Poster Session held here at Bucknell University. Our paper on "The Effect of Anharmonicity on Hydrogen-Bonded Systems: The Case of Water Clusters" came out in print. Three Bucknell students (Devon Husar, Edgardo Parrilla and Judy Phan) have joined our group. They will all be doing research on the thermodynamics of aerosol formation this summer. Dr. Temelso attended a P3 Workshop at Hope College in Holland, Michigan. Dr. Shields gave a "Highlands in Chemistry" seminar at Virginia Tech. Both Drs. Shields and Temelso had meaningful discussions with the chemistry faculty and students at Virginia Tech. Dr. Shields gave brief talk at the "Environmental Snaptalk Symposium" organized by Bucknell University Environmental Center. Dr. Shields attended the 51st Sanibel Symposium in St. Simon's Island, GA.
Our group was awarded 10,000 SU (core-hours) worth of computer time at DOE's NERSC facilites. Berhane gave a talk entitled "Modeling the growth of water clusters and atmospheric aerosols from first principles" to the Bucknell University Chemistry department. Dr. Shields gave a talk on the growth of water clusters and atmospheric hydrates at the 240th ACS meeting in Boston. Drs. Shields and Temelso attended a five-day session entitled "Physical Chemistry of Hydrates, Interfaces, and Aerosols and their Relationship to the Climate System." Kaye Archer and Arianne Gauthier presented a poster of their research at the 2010 MERCURY conference at Hamilton College in Clinton, NY. Dr. Shields and Berhane moved to Bucknell University in Lewisburg, PA.
Our group's undergraduate research program gets underway with two AASU students. Kaye Archer is a senior physics and math major who will study the formation of aerosols. Arianne Gauthier is a rising sophomore who will be working on multi-level studies of breast cancer inhibitor derived from AFPs. Kaye Archer won the best undergraduate poster award for her work on "Accurate Predictions of the Structure and Energetics of Water Decamers" at the 50th Sanibel Symposium held on February 24 - March 2, 2010 at St. Simons Island, GA. Kaye did the work during Summer 2009 with Drs. Berhane Temelso and George Shields at the College of Science and Technology and she continues to do significant research simulating the structure and properties of small water clusters. Our group attended the 50th Sanibel Symposium on Quantum Theory on St. Simons Island in February 24th - March 1st, 2010. Kaye Archer '10 presented "Accurate Predictions of the Structure and Energies of Water Decamers" while Dr. Berhane Temelso presented "Benchmark Quality Structures and Energies for Small Water Clusters." Our group's SGI Altix 3700 Bx2 was installed on campus. Pictures and specs are available here. Dr. Shields presented a seminar on the computational design of breast cancer pharmacophores at Georgia Tech. Click here for details. Duong Vo and Brian Redden joined our group for the Fall semester as part of their Honors Chemistry class's research requirement. Our group attended the MERCURY conference held at the campus of Hamilton College in Clinton, NY. Kaye Archer and Amber Kay Barnes presented posters. The conference concludes a productive first summer of research for our group. Our group was awarded a combined 300,000 SU (core-hours) worth of computer time at 13 TeraGrid computing facilites. The allocation is to be used over a three year span. Our group ordered an SGI Altix 3700 Bx2 shared memory machine with 128 Itanium2 cores, 640GB RAM and 7.2TB of storage. The purchase is funded by an NSF-MRI grant for the MERCURY consortium. The machine should arrive in a month. Arianne Gauthier joined our group for a five week period as part of the STEP program. She is an incoming freshman from Rutledge, GA planning on being a pre-med major. Her project will involve searching through protein databases for peptides that resembles our AFPeps and their activity and relationship (if any) to breast cancer inhibition. Our group's undergraduate research program gets underway with two AASU students. Kaye Archer is a senior physics and math major who will study the formation of aerosols. Amber Kay Barnes is a sophomore rehabilitation sciences major who will be working on breast cancer inhibitors. Our group was awarded a combined 50,000 SU (core-hours) worth of computer time at 13 TeraGrid computing facilites. A large portion of our computations this summer will be performed on the TeraGrid.